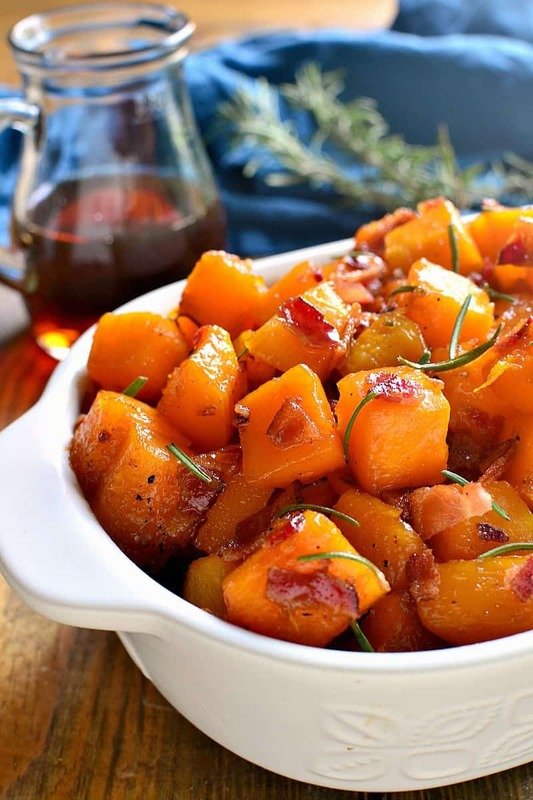 Maple Bacon Roasted Butternut Squash is sweetened with real maple syrup and mixed with crispy bacon. 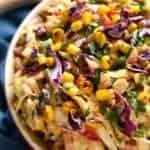 The perfect holiday side dish recipe….guaranteed to become a new favorite! We did it! We pulled it together – the costumes, the candy bags, and even a few decorations – and did Halloween. Yay for us! Despite Ellia’s dreams about missing Trick or Treat, we definitely didn’t. No, we trick or treated. We trick or treated for HOURS. Not just once, but twice. And we have the candy stash to prove it. If we had a working scale, I’d love to tell you *just* how much we brought home. Let’s just say if we combined it all, it would overflow a large paper grocery bag. Which is so much. TOO much! And, to be honest, I have absolutely no idea what we’re going to do with it all. But for now…..we’re just enjoying it….one little piece at a time. So WHY did we trick or treat twice, you ask? (No, it wasn’t for the candy.) It’s because we have a fun little tradition of trick or treating in Grandma & Grandpa’s neighborhood with ALL the cousins! A tradition that started out small and has grown…one or two babies a year….into something HUGE. 20 people huge. Huge enough that we definitely don’t go unnoticed in the neighborhood. No, people definitely take note. Since I’m a part of the group….and obviously used to it….I don’t really think about how big (and imposing) our group is. It’s not until we’re trick or treating, and stop in at an old neighbor’s house, and basically take over the entire kitchen, that I realize. WE ARE A SMALL ARMY! And we really shouldn’t go anywhere all together. Holiday celebrations with extended family? They may have to be a thing of the past. Because let’s be honest….WHO wants to spend Thanksgiving or Christmas with a small army? Especially a small army that’s half kids!!! Yes, whether it’s this year or next…the time is quickly approaching that our small army will be on its own for the holidays. Which will obviously have its pros and cons. One of the major pros? 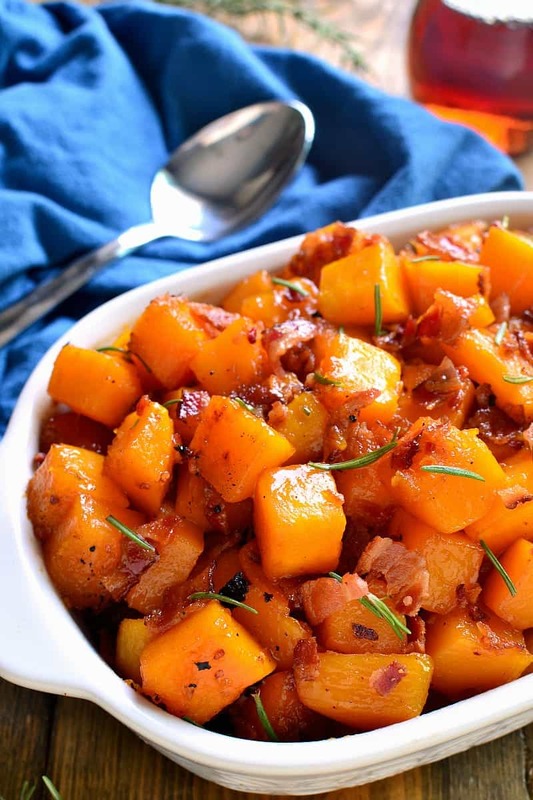 I’m definitely making this Maple Bacon Roasted Butternut Squash recipe. And, with a “smaller” group, there will be more of it to go around! 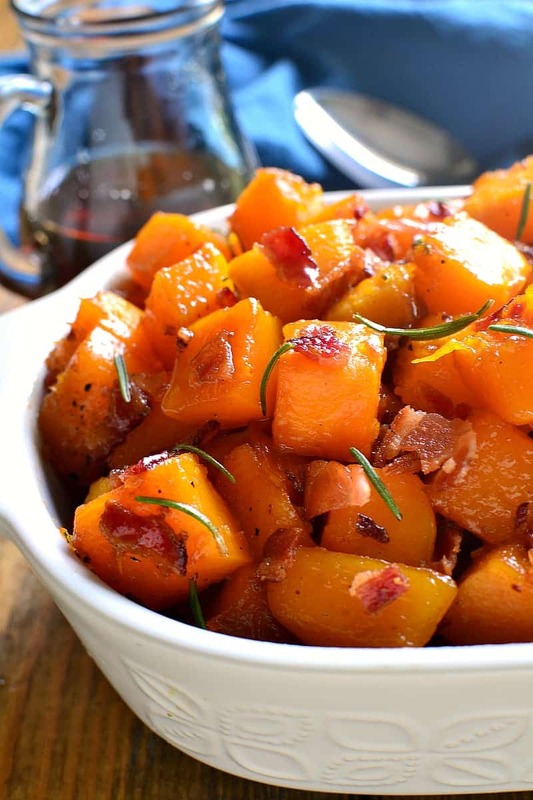 We love roasted butternut squash….and with the addition of maple? and BACON???? It’s out of this world delicious. 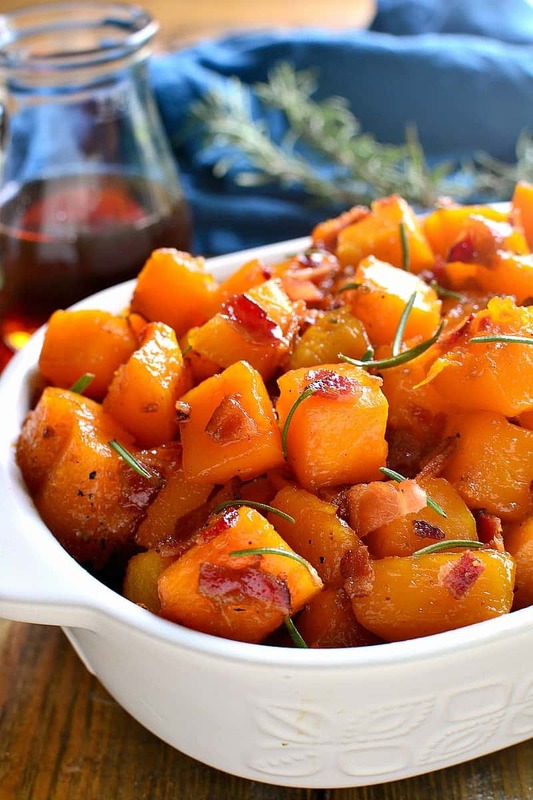 In fact, if Maple Bacon Roasted Butternut Squash were the ONLY dish on the table, I’d be perfectly content. 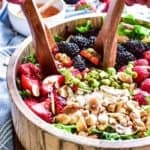 I’d get my dairy from the butter, my veggies from the squash, my protein from the bacon….and beyond that, who needs anything else!!? Of course, for a small army I’ll probably have to make a double batch, but that’s a-ok with me. 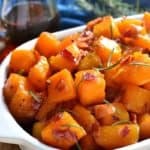 I have the feeling it’s not the only double batch I’ll be making….this Maple Bacon Roasted Butternut Squash just might be my new favorite side dish! 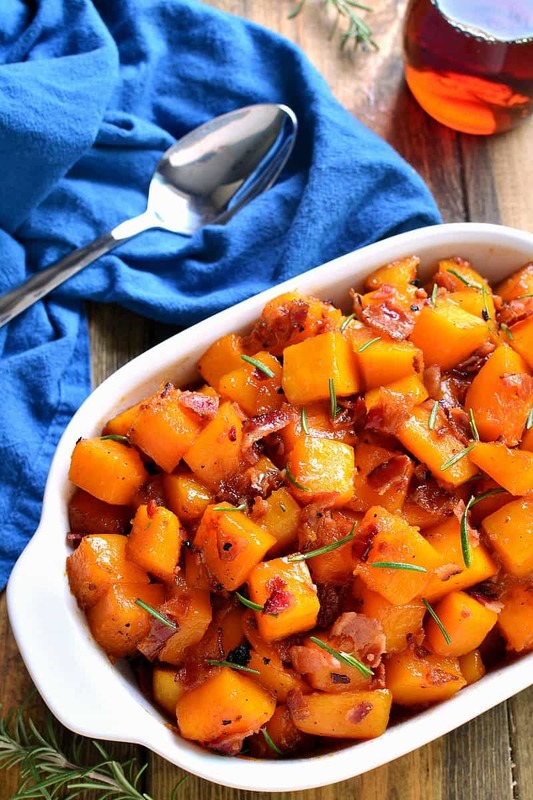 This Maple Roasted Butternut Squash is sweetened with real maple syrup and mixed with crispy bacon. 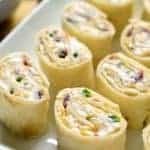 The perfect addition to your holiday menu....guaranteed to become a new favorite! 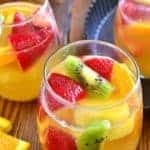 Using a fork, poke several holes in each squash. Set aside. 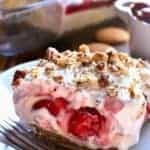 Line a large rimmed baking sheet with aluminum foil. Lay bacon on baking sheet. Place squash directly on upper oven rack; place baking sheet with bacon on lower oven rack. Cook both for 15 minutes. *Cook bacon longer, if needed, until crispy. Once squash has cooled slightly, use a knife to remove outer layer. Cut squash into 1 inch cubes. 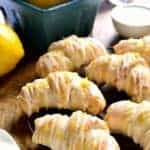 Place squash on large rimmed baking sheet. 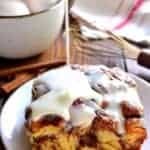 Drizzle with melted butter and maple syrup. Return to oven for 15-20 minutes, stirring once or twice, until maple syrup is caramelized and squash is tender. *Be careful not to let syrup burn. 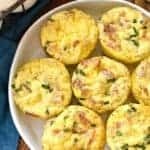 Remove from oven; toss with cooked, crumbled bacon and fresh rosemary. My kids would love to get twice the candy stash..hahaha! How fun! This butternut squash looks delicious and so tempting!! Now this is how one should always eat butternut squash. This sounds awesome! 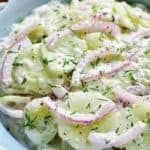 This is one showstopper of a side dish, Cathy! This should be how we eat butternut squash all the time! Perfect for the Thanksgiving table! We LOVE butternut squash! This is gorgeous! Can’t wait to try it! Just wanted to bring to your attention you skipped the step to cook the squash in your 1-12 instructions. Just thought Id let you know. 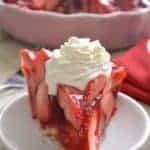 I will be making this tonight and can’t wait! One can buy squash already cut up, how long should I roast pieces? This is an AMAZING combo. can’t wait to try it. Thanks, for sharing. Hi question- Did you bake cubed butternut squash on a 2nd pan or use same pan the bacon was cooked on? Thx in advance!